Ayers taught English at Staunton River High School for 37 years. He has been a fellow of the Virginia Foundation for the Humanities. 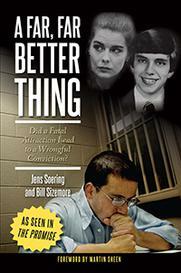 On April 20, the Roanoke Times ran one more piece seeking to exonerate Jens Soering from the guilt of slaughtering his then-girl-friend’s parents. It was not original reporting this time, but rather a reprint of an article from the Charlottesville Daily Progress telling how a retired FBI agent is joining the seemingly never-ending quest to make a silk purse from a sow’s (expletive deleted). It goes without saying that the words “Charlottesville” and “FBI experts” set teeth on edge here in Bedford County where those of us who lived through this grisly event (1985-1990), fear unknowing persons might cause the release of this convicted butcher. Soering, at best, was a lovelorn wretch, goaded to violence by Elizabeth Haysom, his patricidal partner. At worst, he was a bloodthirsty psychopath bent on murder most foul. The Daily Progress article makes much of the assertion by Stanley Lapekas, the latest of the cold case Columbos who take up the “cross of justice” regarding Soering. He contends the evidence didn’t “match up to his story,” meaning his confession bolstered by his answers to questions. According to those who investigated and prosecuted the case, it fit the story “to a T,” so says retired Bedford deputy Ronnie Laughlin, one of the key players in this chronicle. Let’s look at the evidence. 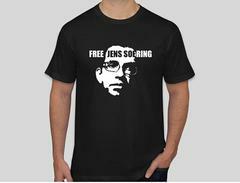 On the first afternoon of Soering’s trial, all the time was taken, carrying in boxes of evidence — boxes, mind you. The lab technician in Richmond remarked that he usually got only a few artifacts, but “you sent the whole damn house.” All this material corroborated Soering’s confession that was given three times before his trial. The first was to the Bedford deputy sheriff in London. Next, to the same deputy plus two British investigators who had discovered the crime among the belongings of the two lovers held in England on check fraud charges. Finally, one was revealed to a prosecutor and defense attorney from Germany. The questioning of the killer in London was mainly done by Jim Updike who would eventually prosecute the case in Bedford. Today he is James Updike Jr., circuit judge for the district. He never was the “John Updike” named by the Daily Progress. Soering’s knowledge of the Haysom residence and its interior, during the questioning, was damning evidence in itself, since he disclaims being there. Notice that certain names seldom appear in any of the stories seeking pardon for Soering, especially Laughlin, Updike and then-sheriff Carl Wells, all main figures in the investigation and trial. The Daily Progress does point out that the most salient figure — Ricky Gardner — did not return phone calls. Gardner has been instructed by the parole board not to discuss the case. The paper did make a point that retired investigator Chuck Reid feels evidence was missing with the loss of a “profile” supposedly made at the time. Reid should know that in a crime of this nature, once motive and opportunity are established, the die is cast and other lines of inquiry are abandoned, and as a consequence lost. Once the confessions were made, that’s the route the Commonwealth followed despite Soering’s subsequent revocation of his own words freely given and plea of not guilty. Wells and Laughlin both agree that Reid was not a major player in the case. Perhaps his two unsuccessful campaigns for sheriff color his opinion today. One matter that should be noted is that our local officers of the law readily admit that without the assistance of their law enforcement colleagues in Great Britain, who chanced upon incriminating documents while investigating Haysom and Soering passing bad checks, this case might never have been resolved.